Phoenix Senior Living breaks ground on The Phoenix at Union Hill, Canton, GA.
Phoenix Senior Living recently broke ground on their new senior living community, The Phoenix at Union Hill, which is scheduled to open in early 2020. Made possible by a loan from SunTrust Bank, this new community, located at 9651 Union Hill Road in Canton, Georgia will bring over 450 construction jobs to the area and, when completed, will employee approximately 84 people. The 3-story community will have 153 apartments – 81 for Gracious Independent Living, 47 traditional assisted living apartments and 25 memory care units in a secured neighborhood, designed specifically to care for seniors. 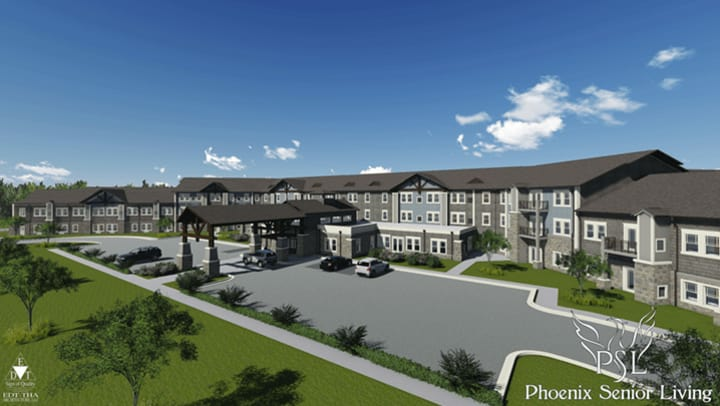 The Phoenix at Union Hill will offer the seniors of Canton as well as the nearby communities service-enriched assisted living and state-of-the-art memory care. The project’s architects and interior designers are creating an interior design that leverages natural lighting and common area space with easy access to outdoor patios and courtyards. The exterior amenities also include a paved walking path around the building with resting spots along the way. The building will also feature an assortment of spacious and beautifully appointed apartments, including studios, one- and two-bedroom apartments with an extensive variety of indoor spaces, including a bistro, piano lounge, full-service salon, pub, library, restaurant style dining rooms, computer room and a fully equipped physical therapy/exercise room. A guest demo kitchen will host cooking demonstrations and classes for residents, their families and the local community. Outdoor amenities will include a pool, gardens, walking space and a children’s playground area. Phoenix Senior Living is a privately held senior housing owner/operator with multiple properties located within suburban communities throughout the southeast region of the United States. Headquartered in Roswell, Georgia, Phoenix develops and acquires independent living, assisted living, and memory care properties. With an Executive Team bringing a combined 90+ years of senior housing experience and with strong ties throughout the Southeast, Phoenix focuses on high quality care with exceptional amenities. Phoenix strives to provide residents and families with a meaningful and joyful experience from their very first interaction with Phoenix; to fully understand and support the uniqueness of every resident’s physical, social, and emotional needs; and to foster a secure, positive, and unified environment with dedicated, tenured employees.